HYDERABAD, India -- Philosophy and advanced science can often merge, to the point that they become indistinguishable. At an eclectic gathering comprising young college kids, 30-something professionals and senior citizens, this was the message that came from senior Buddhist monk, Geshe Nyma Tashi on Sunday morning. 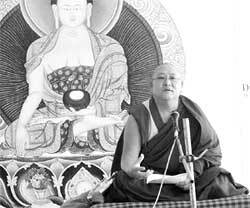 << Buddhist monk Geshe Nyma Tashi delivers a talk on ‘Buddhism and Science’ at the Chitramayee State Art Gallery at Madhapur. The event, held at the Chitramayee State Art Gallery at Madhapur saw the monk and scholar speak on the issue of Science and its relationship with Buddhist philosophy.The organising committee, which comprised of the Buddhist delegation from the Tibetan Buddhist Meditation and Study Centre at Bengaluru were in a tour of Hyderabad to promote their recently established foundation in Hyderabad. The idea of structural theory is similar to the Buddhist notion of all events and objects beings linked to each other,” he said.